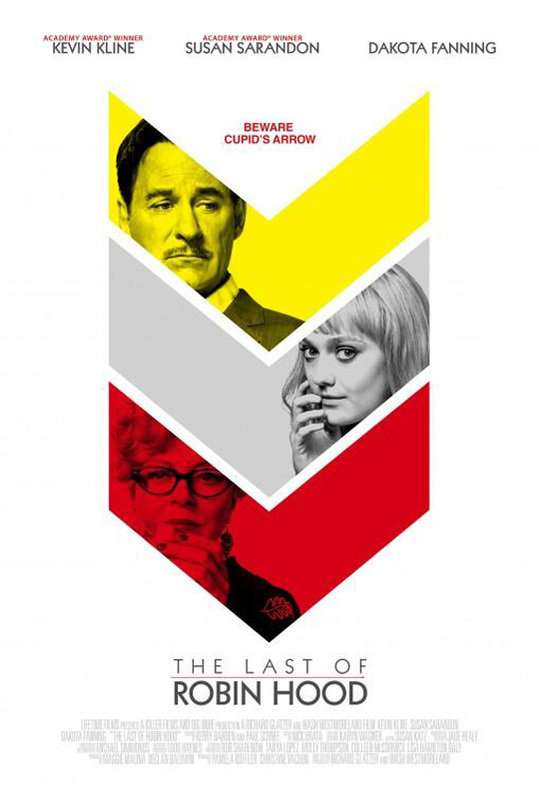 Last year, the biopic The Last of Robin Hood, which features Kevin Kline playing swashbuckling adventure actor Errol Flynn hit the Toronto International Film Festival, and now it finally has distribution in the United States. The Wrap reports Samuel Goldwyn Films has picked up the US rights to the film from directing duo Richard Glatzer & Wash Westmoreland which will follow Flynn's final years and his brief romance with young starlet Beverly Aadland (played by Dakota Fanning), as well as her mother's (Susan Sarandon) role in encouraging the relationship. In addition, we have the film's first poster. Look! Errol Flynn (Kevin Kline), the swashbuckling Hollywood star and notorious ladies’ man, flouted convention all his life, but never more brazenly than in his last years when, swimming in vodka and unwilling to face his mortality, he undertook a liaison with underage starlet Beverly Aadland (Dakota Fanning). The two had a high-flying affair that spanned the globe and was enabled by the girl’s fame-obsessed mother, Florence (Susana Sarandon). It all came crashing to an end in October 1959 when events forced the relationship into the open, creating an avalanche of publicity castigating Beverly and her mother. The Last of Robin Hood is directed by Richard Glatzer & Wash Westmoreland, and Samuel Goldwyn Films will release in fall of 2014. Kline / Fanning is gross. A real drama! Looking forward to it—if I'm up for a drama when it comes around! Sounds interesting, and Kline looks the part.